Personally, I oppose removal of all but the most dangerous offenders. And if offenders are going to be removed, I think removal should occur right after sentencing, rather than making the offenders serve years in U.S. prisons (for which we pay $30k per year per inmate at the federal level) and then removing them. That said, I think this threat to vote against Democrats if removal relief is not obtained is ill-advised. 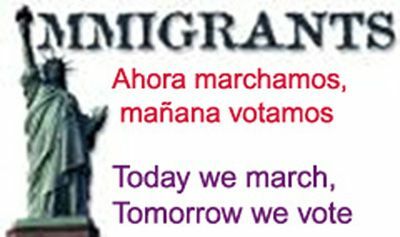 Latinos have become a key voting bloc and could play an important role in upcoming midterm elections in November…..”For Latino voters in particular, we’re going to make it very clear that this is an outcome that will affect the elections,” [La Raza head Janet]Murguia said. The reason legislation hasn’t passed and we don’t have relief for the undocumented is Republican opposition. Why withhold votes from the party out to help — Democrats? If Republicans gain a majority or a Republican becomes President, the undocumented will be treated even more harshly. Threatening to vote against Democrats seems self-destructive. The Latin press is reporting new statistics that under Obama, deportation orders of non-criminal undocumented residents has risen while deportation of those with criminal records has fallen (via Google translate). Between fiscal years 2012 and 2014, cases of deportees faced criminal charges have decreased from 16% of total to 12%, according to data from the nation’s immigration courts. According to the [Trac] study, during the first five months of fiscal year 2014, 58,951 have been issued deportation orders, of which only 7,067, corresponding to 12 percent, had criminal charges. In 2013, of 193,858 deportation orders of foreigners, 26,921 were for people who had criminal cases, i.e. 14 percent of the total. I’m not a statistician and have only spent a few hours reading the TRAC report and BOP statistics pages, but I wonder whether the recent reduction in the number of deportation orders of those with criminal records is due to the fact that we are incarcerating so many for longer terms, and there just aren’t as many inmates approaching release in 2014 and 2015 as there were in 2012 and 2013. While there are 3,900 ICE detention facilities in the U.S reporting detainers (see discussion of Table 6), and several institutions have immigration courts in them, inmates with long sentences may not be called to immigration court until they get close to release, and they don’t actually get deported until they have finished serving their sentence. According to Bureau of Prisons’ statistics for January, 2014, of our 216,000 federal inmates, 36,363 or 17.5% are Mexican citizens. There are another 5,500 who are citizens of Cuba, Colombia and the Dominican Republic, and 10,000 whose citizenship is unknown. There are a total of 71,710 Hispanic inmates — 34.6% of all inmates. The Criminal Alien Program (CAP) provides ICE-wide direction and support in the biometric and biographic identification, arrest, and removal of priority aliens who are incarcerated within federal, state, and local prisons and jails, as well as at-large criminal aliens that have circumvented identification. It is incumbent upon ICE to ensure that all efforts are made to investigate, arrest, and remove individuals from the United States that ICE deems priorities by processing the alien expeditiously and securing a final order of removal for an incarcerated alien before the alien is released to ICE custody. The identification and processing of incarcerated criminal aliens, before release from jails and prisons, decreases or eliminates the time spent in ICE custody and reduces the overall cost to the Federal Government. ERO officers and agents assigned to CAP in federal, state and local prisons and jails throughout the country screen inmates and place detainers on criminal aliens to process them for removal before they are released to the general public. After the screening process and interviews, ERO initiates proceedings to remove the criminal aliens from the United States. Approximately 27 percent of inmates in Federal Bureau of Prisons (BOP) custody are non-U.S. citizens. ERO created the DEPORT Center in Chicago to process this population through CAP. ERO officers and agents assigned to the DEPORT Center conduct interviews of BOP inmates nationwide using video teleconference equipment. Through the combined effort of the DEPORT Center and local ERO resources, criminal aliens from all federal detention facilities are taken into ERO custody upon completion of their sentences. With the various CAP programs tracking inmates daily, one would think few get through the cracks and avoid deportation upon completion of their sentence. This is the TRAC report on new filings in immigration courts. Here is the current ICE detainer form. Here is the ICE offense severity chart. Here is the TRAC 2014 report for U.S. Deportation Proceedings in Immigration Courts by Nationality, Geographic Location, Year and Type of Charge. Here is an American Immigration Council report on the ambiguities in the CAP program. And one entitled The Growth of the U.S. Immigration Machine finding that more immigrants are being removed from the U.S. than ever before. While some prisons have inmates meet with ERO officers shortly after their arrival, there doesn’t appear to be a set timetable for the initiation or completion of court removal proceedings against them. For 2013 and 2014, sequestration cuts may also have played a role in delaying final outcomes, i.e., the issuance of an order of removal at the end of an inmate’s sentence. So I agree we are deporting too many people, especially those without serious criminal convictions, but I’m not ready to conclude that the percentage variance between removal orders of those with and without criminal convictions is the product of ICE getting lax on those with convictions, as opposed to other factors. I’m more likely to believe ICE has too much discretion when it comes to deporting those without criminal convictions, and is over-exercising that discretion. I also think there is too much sharing of information between ICE and state and local law enforcement, resulting in detainers and transfer to ICE of those who otherwise would be released after a minor conviction or arrest.